Mini ultrabook. A handy 11.6-inch notebook with a low-voltage Core i5, USB 3.0 and HD 4000. 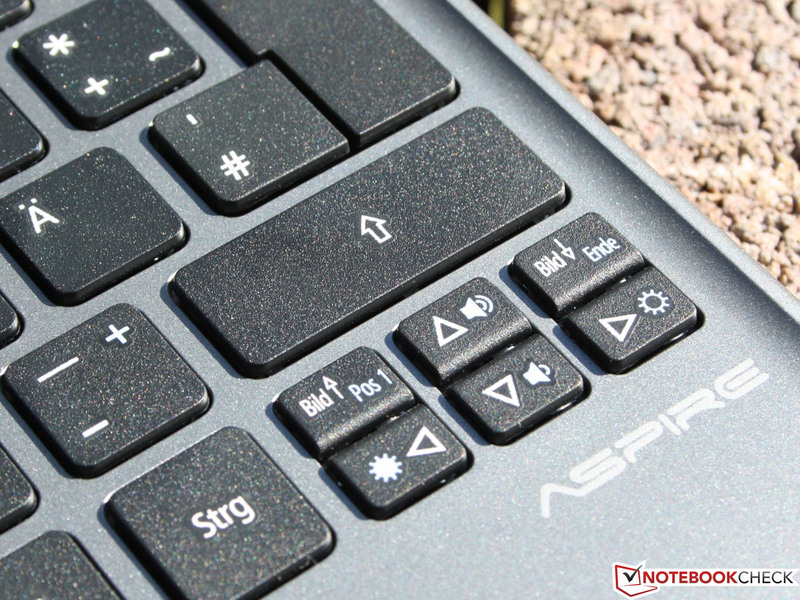 The Aspire costs significantly less than an entry-level ultrabook, but falls short of a few mobility factors. 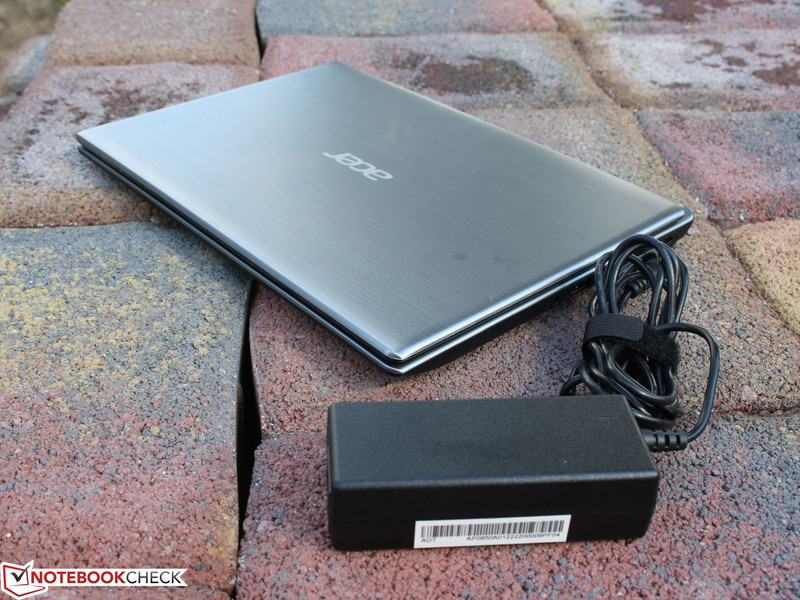 Acer Aspire V5-171-53314G50ass: Mini ultrabook or performance subnotebook? 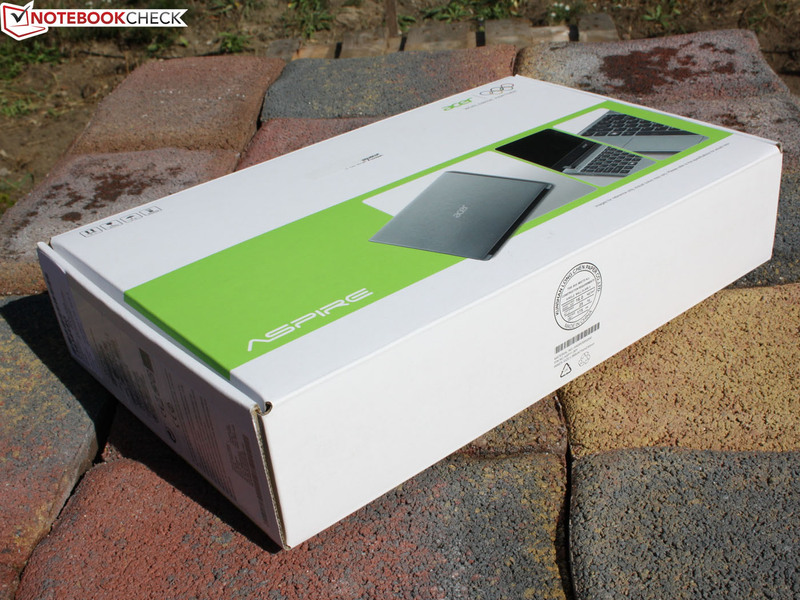 One year ago, Acer started the ultrabook era with the Aspire S3-951-6646. Since then, the next generation processors (Ivy Bridge) became available in the successor and the price of 700 Euros (~$901) for an entry-level ultrabook remained the same. The 11.6-inch form factor was represented only by expensive models such as the Asus UX21E. 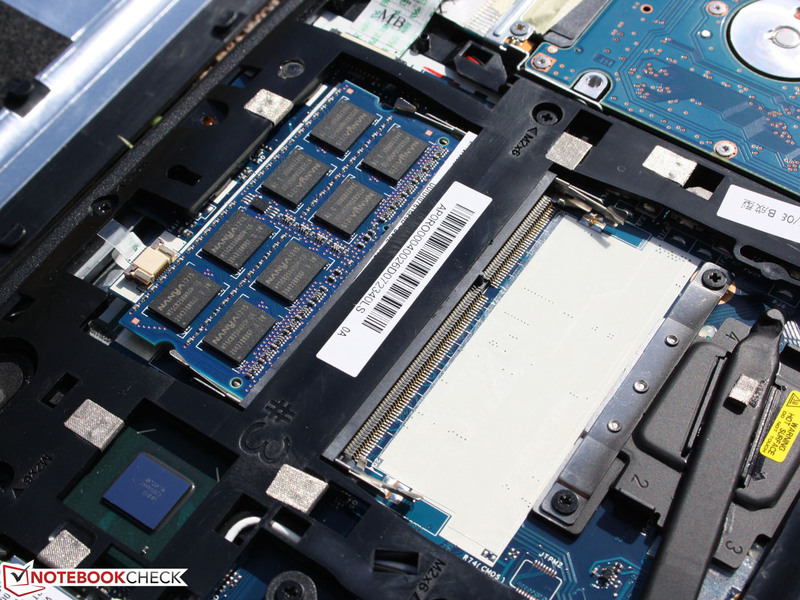 There are many netbooks and AMD Fusion devices (E-Series APU) in this handy form factor, but considering the poor performance, they are not always the best choice. Is there something missing in the price range between 500 and 600 Euros (~$644 and $772)? How about a low-voltage Core processor in an inexpensive plastic chassis? High-tech gadgetry, such as SSD or IPS panel, is not an option. There is a simple, rotating HDD, 08/15-glare type display, and a small 37 Wh battery. An acceptable compromise? 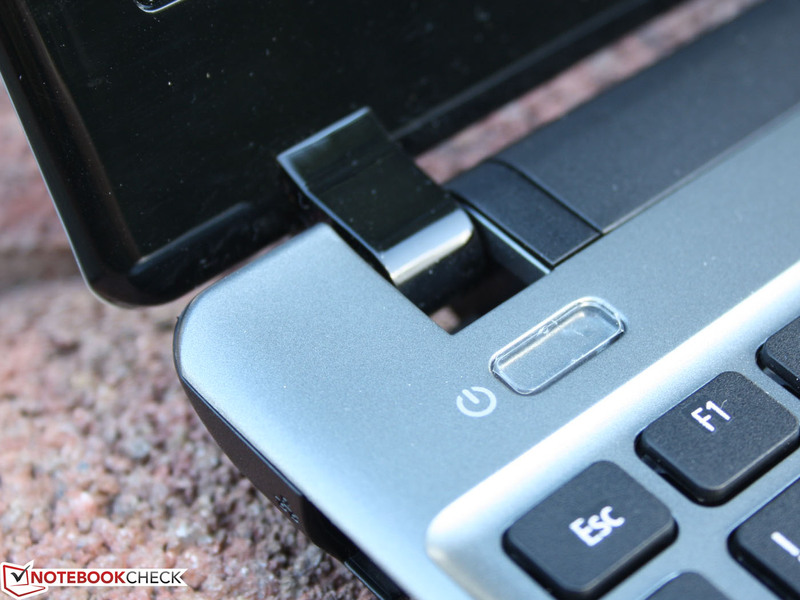 Or should mobility fans save for a real ultrabook? 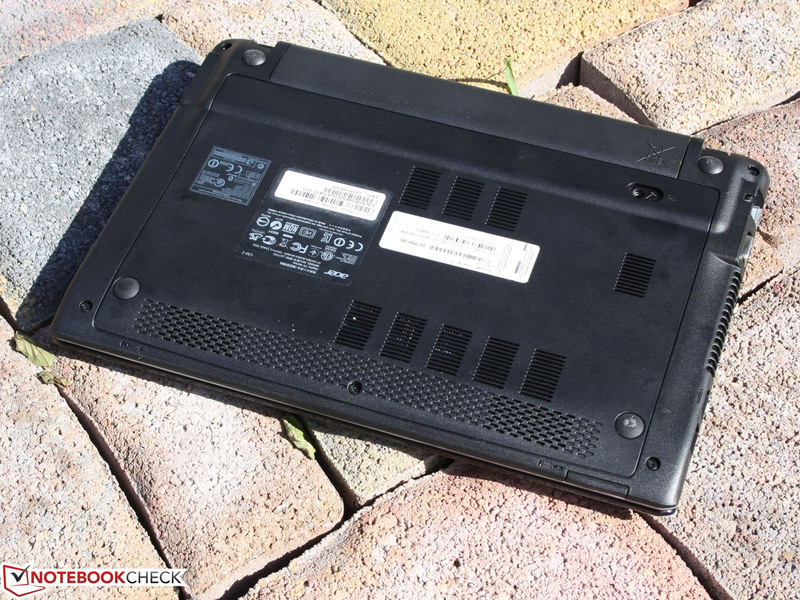 The chassis of the Aspire V5-171 is an offspring of the Aspire One 756, a low-end consumer model with either a Pentium or a Celeron low-voltage. Aside from the attempt to make the device look of higher quality with the aluminum pattern, the cases are identical in every detail. Thus, our test unit also inherits the negative characteristics. The finish is not the glittering one of the One 756 and with its matte, mostly fingerprint repellent surface, is fit for office use. The display frame is still very shiny and picks up a lot of fingerprints. 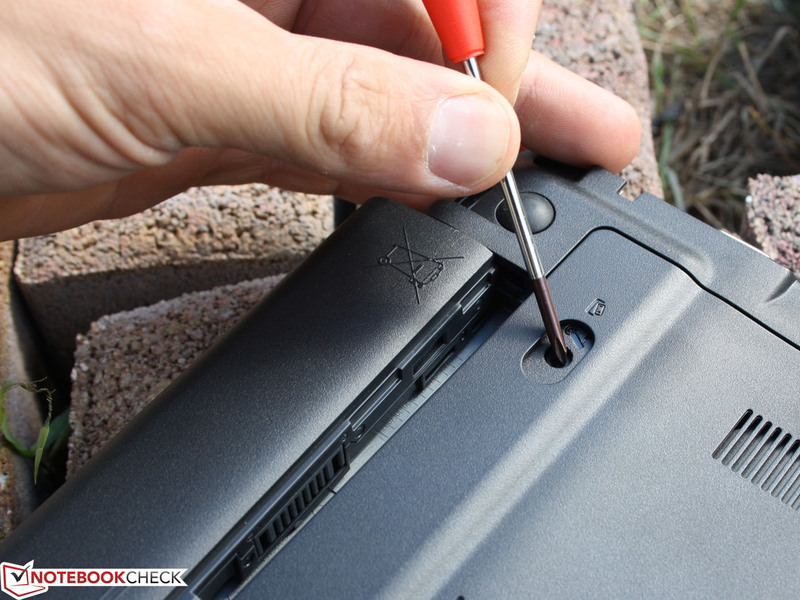 The battery can be removed, when using the notebook on a desk. 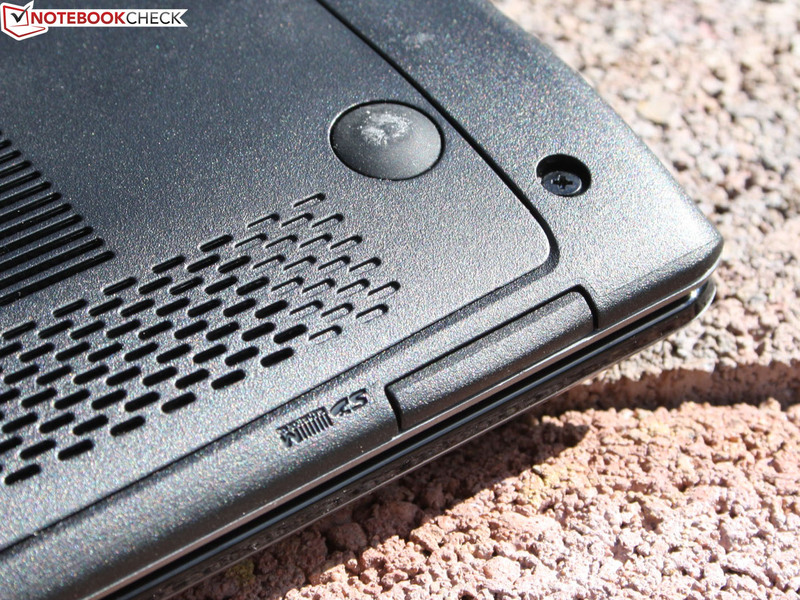 The chassis is 24 mm (0.94 inches) high at its thickest point (without the feet). The display lid is relatively thin and flexible within limits. The surface on the other hand, does not give in. The hinges are tightly fixed to the base unit. You will need both hands to open the notebook. The lid does not wobble, thanks to the tight hinges, and has an end position of 180 degrees. The palm rests and the bottom cover do not give in. The keyboard is solid and the battery does not wobble. The reason for the flexible chassis is the large maintenance cover, which gives access to the whole interior. But it can hardy withstand tensile forces. The lid and base unit are clamped together firmly. The hinges hold the base unit and the lid tightly together. The above interfaces are the bare minimum and can also be found on a netbook. 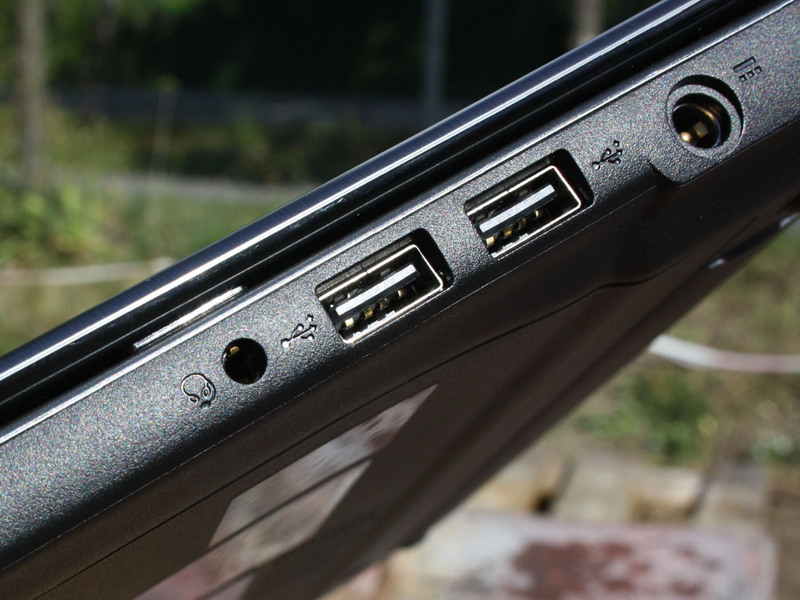 Even USB 3.0 is available on a lot of low-cost devices, such as the Lenovo Ideapad S206 (from 275 Euros, ~$353). The Ethernet port (RJ45, Gigabit-LAN) seems mandatory. Confusing: Some ultrathin devices use a USB-LAN adapter instead (for example, the Asus UX32A). Wireless "Internet" is available via the Broadcom BCM4322. The WLAN adapter supports Draft-N and also encompasses the Bluetooth 4.0 module. As before, we recommend using the RJ45 cable and the Gigabit switch for the transfer of large amounts of data. The 1.3 MP webcam looked pixelated. Our sample images of 1280x720 and 640x480 pixels are significantly blurred (noise). This is a bad result for daylight. A small status LED in the TFT frame indicates activity. Thus the user can be sure whether or not he is being recorded. In the box we find a set-up pamphlet, the warranty terms, and a polishing cloth. The access to the hardware could not be any easier. Remove the screw, push towards the front, done. One system memory slot (4 GB) is taken; there is a second one available for another 4 GB. 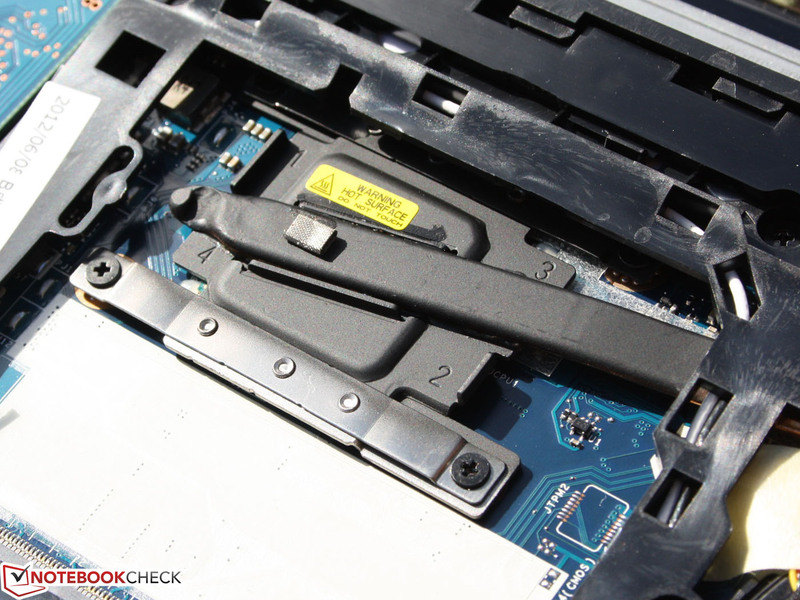 The HDD is held without screws in a rubber mount. The fan can easily be cleaned. 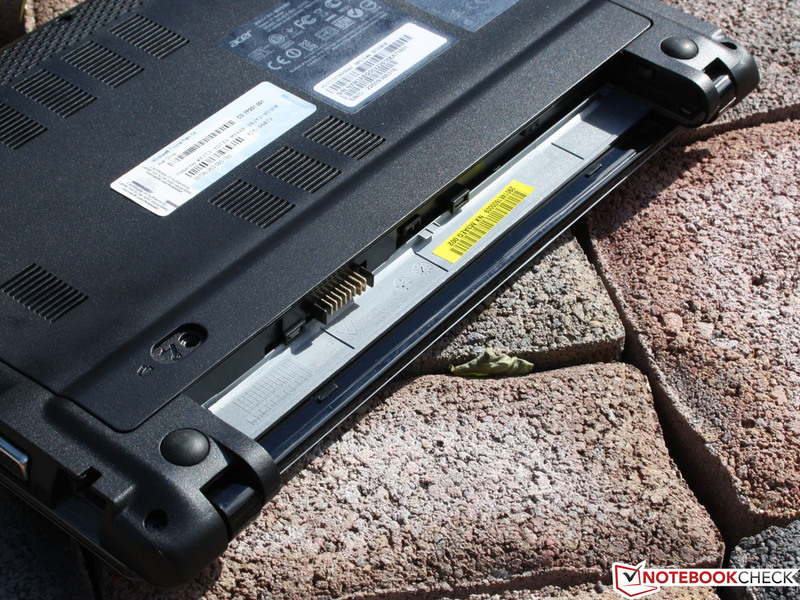 12 months bring-in (sending at own costs) is the minimum warranty for a notebook. For 35 Euros (~$45) this can extended to three years. For 80 Euros (~$102) the Advantage warranty option will cover the sending costs. This even includes insurance with 100 Euros (~$127) deductible. The keys have a large gap, which allows for comfortable typing. In practice, even larger hands will have enough room. The firm, but not hard, stop confirms the solid keyboard. The typing feel is still not satisfactory, since the keys are perfectly flat and not concave. There is almost no tactile differentiation. In addition there are the short stroke and a pressure point, which is clear only right before hitting the key. The latter is also not clear enough. A positive aspect of the keyboard is the spacious layout and the clear caption. The surface is decently rough (generated friction noise), relatively large, and is sensitive up to the edges. 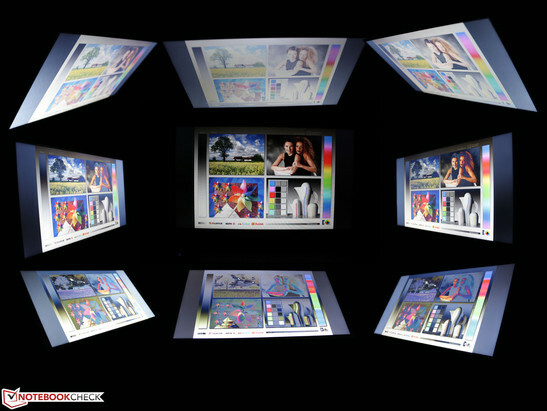 The Synaptics ClickPad V8.1 supports all of the multi-touch gestures (resize, scroll, rotate, etc.). The two mouse buttons are located at the front left and right, under the surface. In addition, the pad registers a push in the middle or upper area as a left click. The higher you go, the harder this becomes. The short stroke diminishes the enjoyment of this input method. It took some getting used to, but after a short time we could click an object with one finger (press anywhere on the ClickPad and hold) and move it with another. 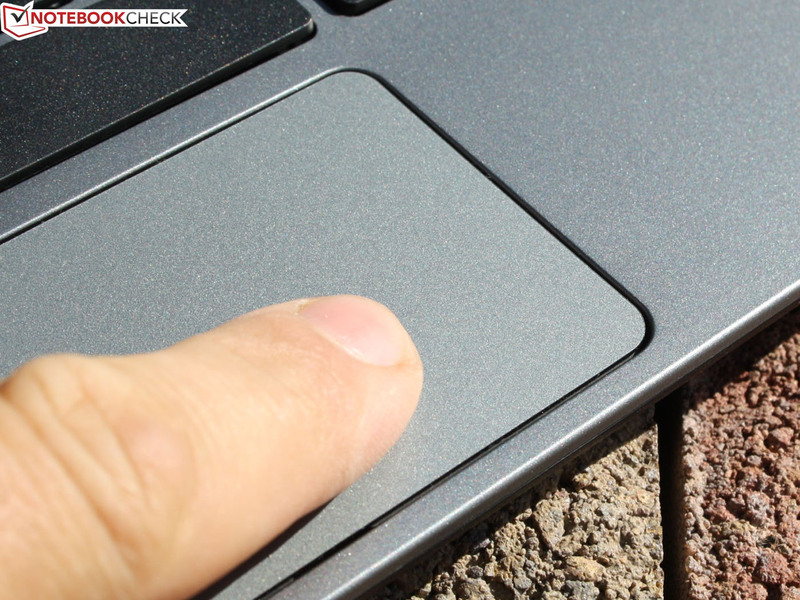 The handling can be adjusted to individual taste in the ClickPad settings. The 11.6-inch screen (Type N116BGE-L42) has a resolution of 1366x768 pixels. The HD resolutions have become a standard and there are almost no alternatives. The panel is not anti-glare. The glare type strategy is typical of Acer (see One 722/725/756). The competition has been offering a matte screen for years, even in low-cost systems (Lenovo ThinkPad Edge E130/E135, Samsung 305U1A; in 11.6-inch, Acer only has the TravelMate B113-M). Still, the glare type provides optically high-contrast colors. However, the measured contrast ratio is only 181:1. The color space is very small in comparison to AdobeRGB and sRGB. But the competition does not offer anything better. Even the ultrabook Asus UX21E for more than 1000 Euros (~$1287) has a TN panel. But the color space reproduction is only important for professional image editing, which is rarely done on an 11.6-inch notebook. The brightness of 190 cd/m² is sufficient for indoor or night use. But it is not enough to counteract the reflection in daylight. Even with a matte panel, a minimum of 250 cd/m² brightness is needed in order to easily read from the display. But now, depending on the light, slight up to extreme reflections prevent any work. Reading from the screen becomes a torture. The Aspire V5-171 does not have a light sensor for adaptive luminance adjustment. The horizontal viewing angles are tight, but still better than the vertical ones. Only up to 45 degrees from the central position are the colors and structure unaltered. Then the colors are inverted (ghost images). Vertically tolerates almost no deviation. Text is only readable up to 30 degrees. But the color inversion begins at 10 degrees. The Asus UX31A with an IPS panel, which offers viewing angles of almost 90 degrees on each side, shows that this can be done better. 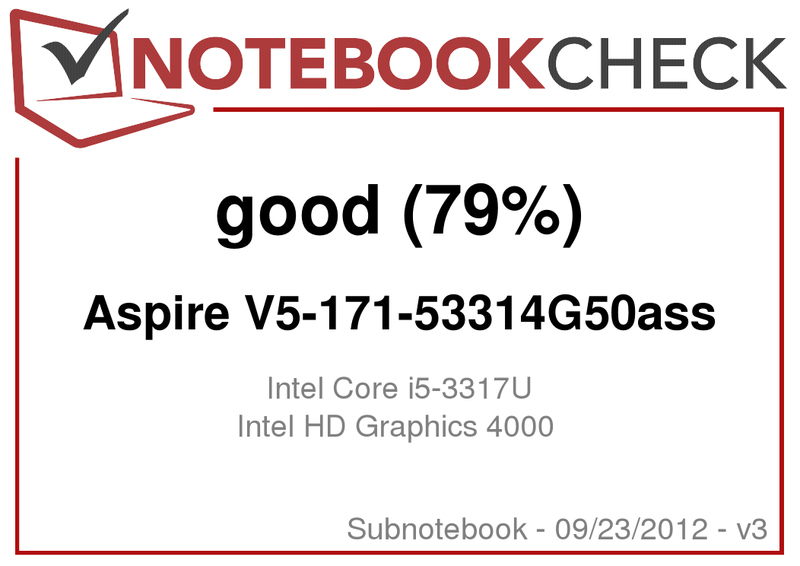 The Aspire V5-171-53314G50ass is equipped with an Intel Core i5-3317U (2 x 1.7 GHz). The Ivy Bridge processor can be found only in ultrabooks starting at 800 Euros (~$1029), for example the Asus Zenbook UX32VD, MacBook Air 11-inch 2012-06, Samsung Series 5 530U3C-A01DE. 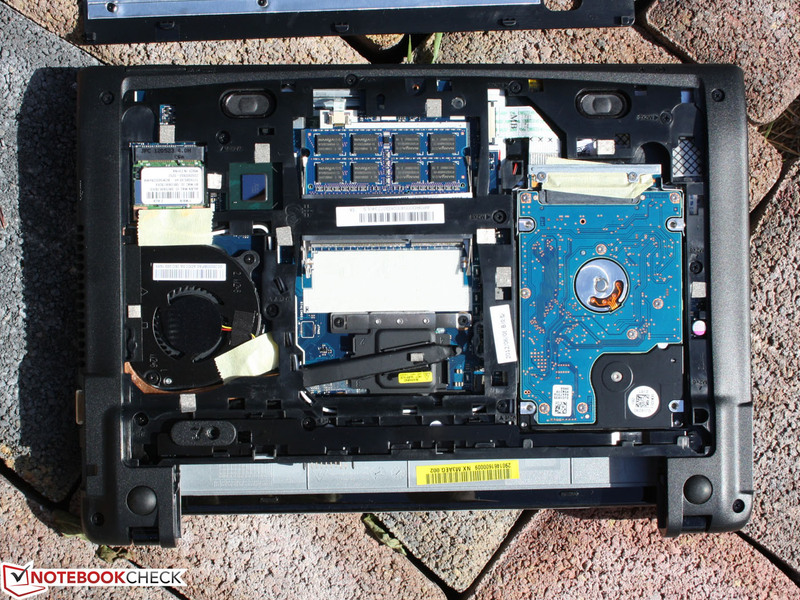 The cheaper ultrabooks from 700 Euros (~$899) rely mostly on Core i3-2367M. 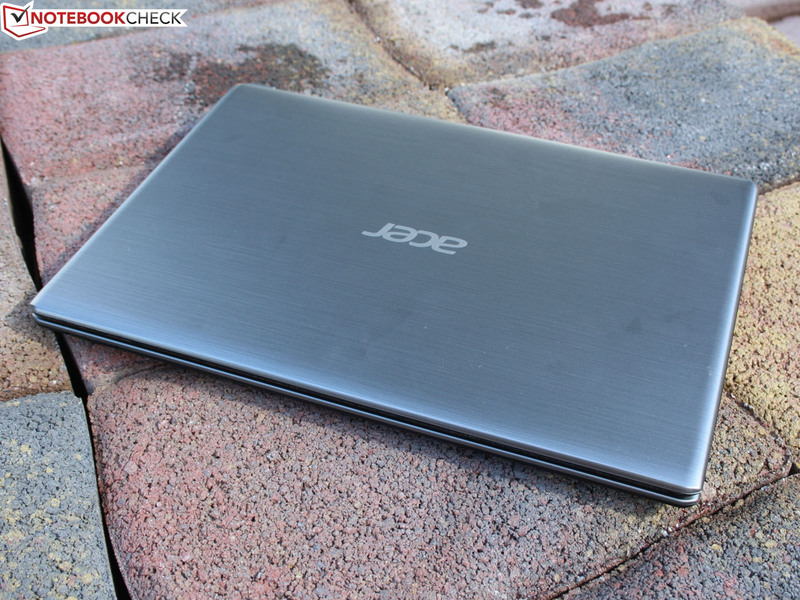 The same goes for Acer: the V5-171-32364G50ass with this i3 costs 480 Euros (~$617). The i5 CPU can increase its clock frequency via the Turbo Boost 2.0 (2.6 GHz), which make it interesting in comparison to the i3, especially in CPU heavy programs. The 17 W processor (TDP) belongs to the ultra-low voltage category and is thus suitable for small subnotebooks. 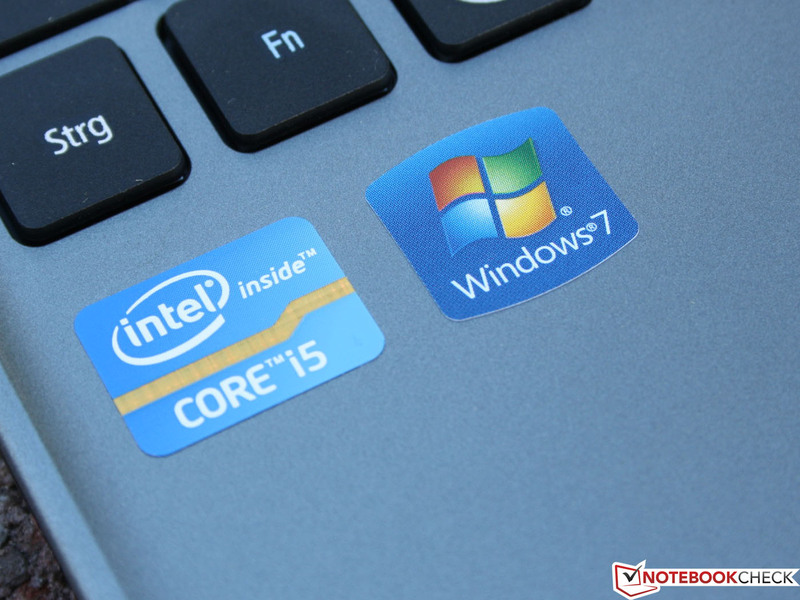 Has the Core i5 really got the same performance as in the 13.3- and 14-inch ultrabooks? The Cinebench R11.5 CPU Multi test result (2.38 points) is the same as the Samsung Series 9 900X4C. The cooling system of the small chassis manages to keep the temperatures within the Turbo limits. The same goes for the Cinebench R11.5 Single test (1.05 points). Here the above mentioned Samsung scores 1.07 points. De facto, there is no difference. It gets even better: on battery power the user does NOT need to give up performance. The R11.5 Multi-test showed identical results. The alternatives, available with i3 (Sony Vaio SVT1311M1E, Asus UX32A-R3001V), fall significantly behind, as the following table shows. The i3 is still the faster alternative to the Pentium 987 in the Aspire One 756. The application performance in PCMark Vantage (2008) and PCMark 7 (2011) is good. Systems with an SSD and 3317U, such as Satellite Z930-119 (+100% @PCMark Vantage) or Samsung 900X4C-A04DE(+42%, slow SSD), are faster than our test unit. The differences in PCMark 7 are similar. i3-2367M systems with a normal HDD are 25% to 40% slower (Asus UX32A-R3001V @PCMark Vantage). Factors with an impact here are the faster HD 4000 (instead of the HD 3000 in i3) and the more or less slow HDDs in the other devices. A Pentium-987 system is 40% slower (Acer Aspire One 756, HDD @PCMark Vantage). Regardless of Core i3 or i5, a significantly greater impact on real operating speed was the hard drive. So if you are to swap the HDD for an SSD (from 45 Euros, ~$57), then the cheaper i3 model will also be fairly quick. When purchasing, users should note the 7 mm installation height. The Hitachi Travelstar Z5K500 HTS545050A7E380 is a 7 mm high HDD with 320 GB capacity, but with a rotational speed of only 5400 RPM. Evidently, it has a high performance, indicated by the sequential read rates of 85 to 102 MB/s. Smaller files are read significantly slower (4K: 0,316 MB/s) and with a great delay, because of the high access time of 20 ms. Because of this, the HDD scores in PCMark Vantage (3029 points) and PCMark 7 (1313 points) are below average. Quick 7200RPM HDDs are 32% faster (Dell Vostro 3360). The HD 4000 in this ULV processor is overclocked (1050 MHz) and downclocked (350 MHz) via the Turbo mode. On battery power this makes it somewhat more hesitant, but the Cinebench R11.5 GL benchmarks remain the same. On AC power, the GPU performance, in contrast to the CPU tests, falls up to 40% behind the 3317U systems (also IGP HD 4000). 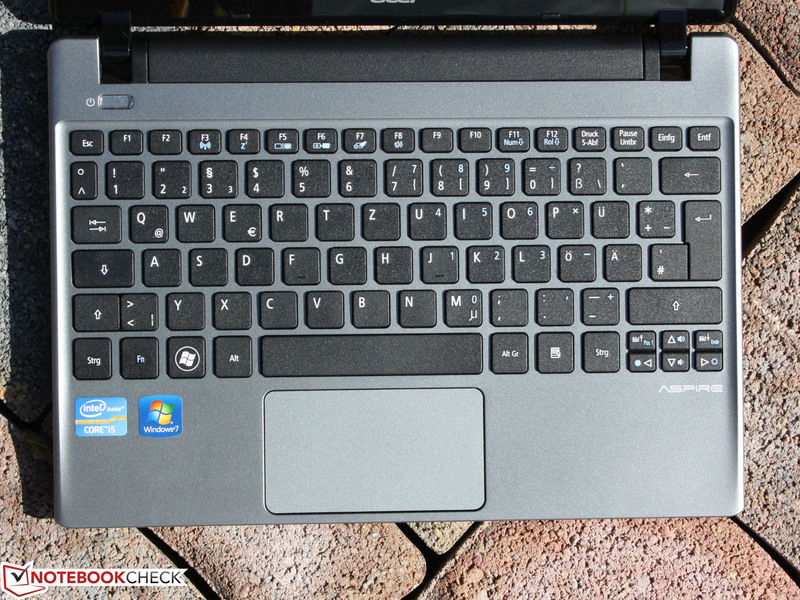 Only the Lenovo IdeaPad U310 was as bad in the GL-benchmark. The 3DMark 2006 also showed a weak performance; other ultrabooks (3317U, IGP) are 7 to 35% faster. The old 3DMark is heavily dependent on the CPU, which further proves that, given the high CPU performance (see Cinebench tests), the GPU in our V5-171 is at a disadvantage to other devices. The HD Graphics 3000 in the Core i3 alternatives cannot keep up (-10% @Toshiba Portégé Z830-10N). The integrated graphics card is enough for the occasional game, if the user can make do with reduced resolution and deactivated anti-aliasing (lower details). The performance, compared to technically identical ultrabooks, is rather poor; the HD 4000 always falls short of expectations. In Risen (low) the Samsung 900X4C-A04DE was 38% faster. In Anno 2070 the Satellite Z930-119 managed 41% better. For Mass Effect 3, Battlefield 3 and FIFA 13 we do not have any results of the 3317U. The Aspire V5-171 is nice and quiet only in idle, when the constantly running fan provides a noise level of 30.5 dB(A) to 31.3 dB(A). The difference is so small that the user will perceive it as a constant whisper of the fan. But under load, the small cooling system can really turn on: 40 dB(A) during the stress test and 39 dB(A) during the 3DMark 2006 (same as gaming). 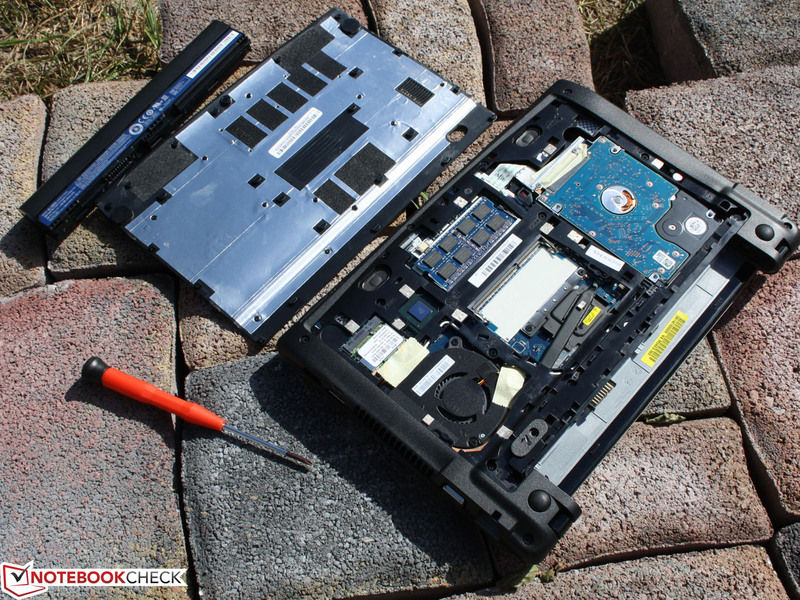 The results are identical to those of the Aspire One 756. The Aspire V5 is no heater, but it can be used to warm your hands in the coming winter - especially when the notebook is under load. In idle we measured an average of 34 oC on the top and 36 oC on the bottom side. This is almost lukewarm (~36 oC), but still acceptable. The 11.6-inch notebook becomes excessively warm during the stress test with Prime 95 and Furmark. The bottom cover reaches up to 61 oC. This increases the average to 48 oC (bottom side). Thankfully, the top side remains cooler, but the V5-171 is still not ideal for lap use. All in all the heat corresponds to the available performance, especially since high performance tasks are either rare or carried out on a desk. Good news: the system went through several hours of extreme testing for the CPU and HD 4000 without CPU throttling. The Turbo dropped the CPU frequency after a couple of minutes down to 1.7 GHz, which is the default one. Throttling would mean that the frequency has dropped below this value. As we previously mentioned, the results of the CPU tests are on the typical level for an i5-3317U. The theoretical single-core Turbo frequency of 2.6 GHz was reached during the Cinebench R11.5 single-core tests (fluctuating around 2.5 GHz, at a constant level). (-) The average temperature for the upper side under maximal load is 42.4 °C / 108 F, compared to the average of 30.7 °C / 87 F for the devices in the class Subnotebook. (-) The maximum temperature on the upper side is 50.6 °C / 123 F, compared to the average of 35.8 °C / 96 F, ranging from 22 to 57 °C for the class Subnotebook. (±) In idle usage, the average temperature for the upper side is 33.9 °C / 93 F, compared to the device average of 30.7 °C / 87 F.
(-) The average temperature of the palmrest area of similar devices was 28.6 °C / 83.5 F (-14.9 °C / -26.8 F). One should not expect much of the two speakers on the 11.6-inch notebook. The two stereo speakers, located under the palm rests, can at least cover the lowest level of quality: they do not distort the sound at higher volume. Confusing: The highs-heavy sound without any trace of bass is no bliss. External speakers, connected via the 3.5 mm jack or HDMI port, are a must for music fans. The energy consumption is between 7-9 W in idle and 31 W under load with 3DMark2006. The power consumption in office use is between 9 and 25 W, depending on the energy profile, brightness, and the activity of the wireless modules. Only AMD's APU systems in 11.6-inch notebooks are more efficient than our Core i5 low-voltage system: Lenovo ThinkPad X130e (4-8 W Idle, about 26 Watt @ 3D). The difference is not significant, especially since no customer buys a notebook for its power consumption when plugged in. The 65 W power supply is oversized for this energy consumption. But this way there is sufficient power left for charging the batter, even under high load. The 37 Wh battery (4 cells) proved to be what we expected, because of its lower capacity, and these are no record runtimes. 11.6-inch notebooks, such as the ultrabook UX21 with 217 minutes, are not necessarily better. The vast majority of 13.3- and 14-inch ultrabooks (3317U) manage 260, or even 315 to 344 minutes (WLAN test). In idle the 11.6-inch notebook lasted 6:36 hours. This is even a bit more than the Pentium based Aspire One 756. The idle runtime is impractical, since it only utilizes minimum brightness and inactive WLAN and CPU. The WLAN surfing test shows a more practical result. Here brightness is set at 150 cd/m² and a script reloads the websites every 40 seconds (some with multimedia content). 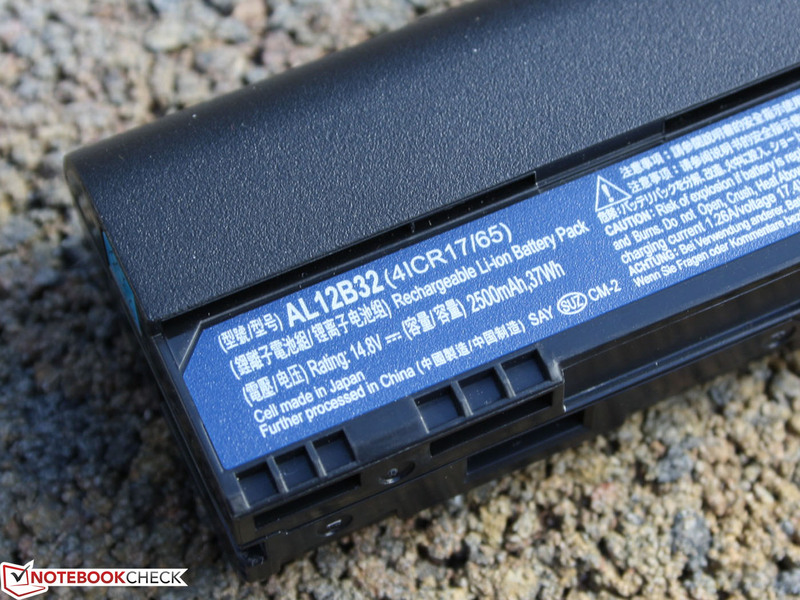 With a 48 Wh battery, the 11.6-inch notebook could have easily managed five hours. Customers would have surely tolerated a battery sticking out. In comparison the APU system tends to perform better, mainly because the manufacturer has equipped them with larger batteries. The 8:45 hours of the Samsung 305U1A (11.6-inch, 66 Wh) or the 7:07 hours of the Lenovo ThinkPad X130e (62 Wh) serve as an example. But with these lower-priced devices, the user must take into account the lower processing power. Small notebook, big punch? Not completely true. 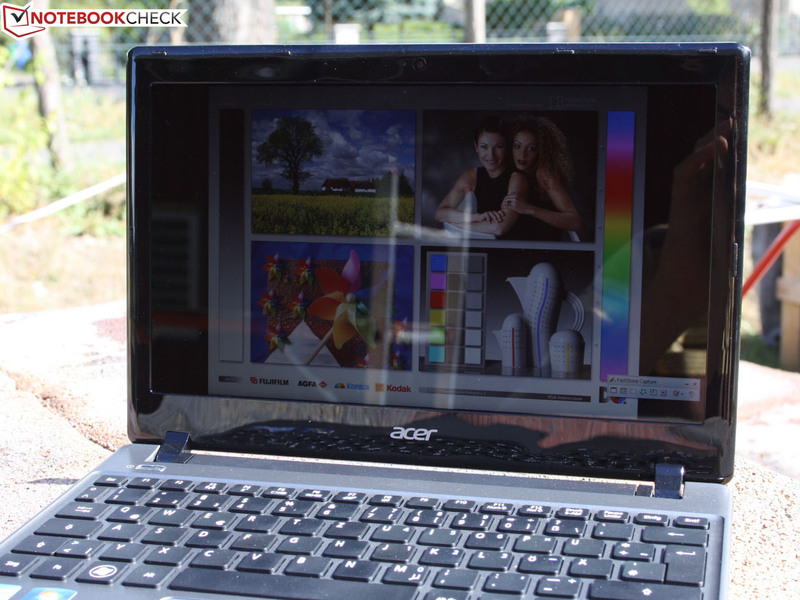 We must disappoint those seeking a good price-performance ratio in the Acer Aspire V5-171. Sure, on the performance side the 11.6-inch notebook is almost on the level of an entry-level ultrabook. This was expected, since the Core i5-3317U is the same processor as in most of these. Then the descent begins, at which end lies a good, but in some details negative, rating. 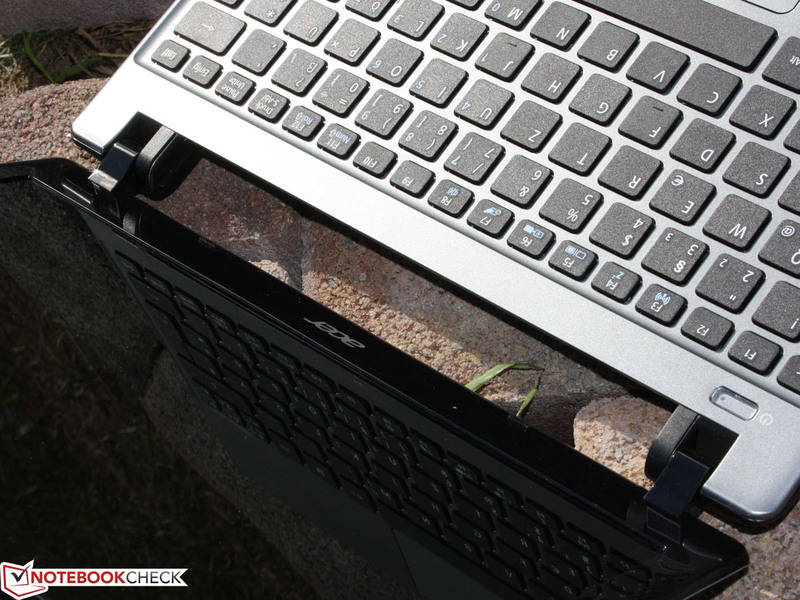 Flexible chassis, weak key feedback, only three hours battery life, and high temperatures under load. The most criticism goes to the glare type panel with narrow viewing angles and low brightness. 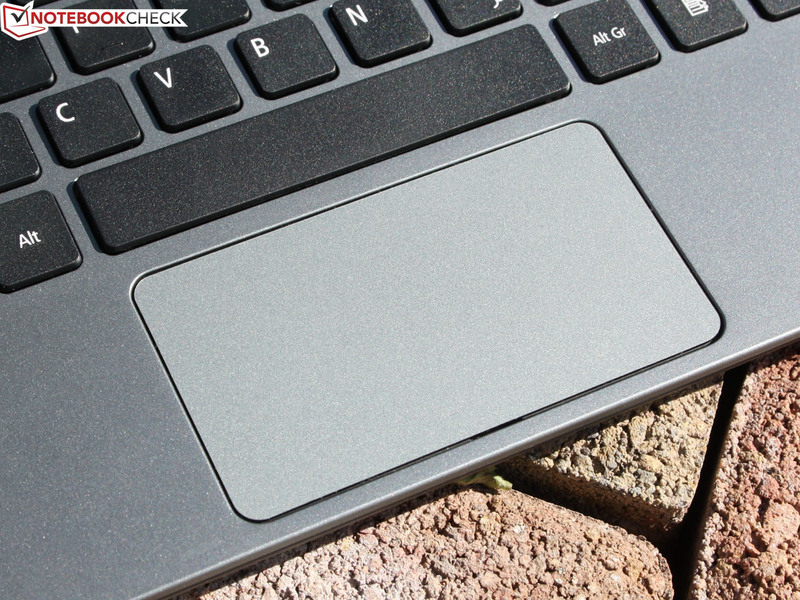 Those who rarely use the 11.6-inch notebook in daylight and keep it mostly as an office PC connected to the USB 3.0 dock, will surely receive a lot of performance for a small price. Hardware enthusiasts will buy a 128 GB SSD for almost 80 Euros (~$102) and will thus significantly decrease the loading times. Tip: Lenovo offers its old ThinkPad X121e with Intel Core i3-2367M starting from 390 Euros (~$501, Free DOS Version). It has similar performance (up to the HD Graphics), longer battery life, matte display, and a better keyboard at a lower price. and can be unlocked only with a pen or a screwdriver. Its capacity of 17 Wh is only enough, even with the efficient hardware, for not too long runtimes (three hours WLAN test). The whole bottom cover can be removed after releasing a single screw. The 2.5-inch HDD can be exchanged for an SSD. Warning! The bay allows a height of 7 mm. Normally this is 9 mm. 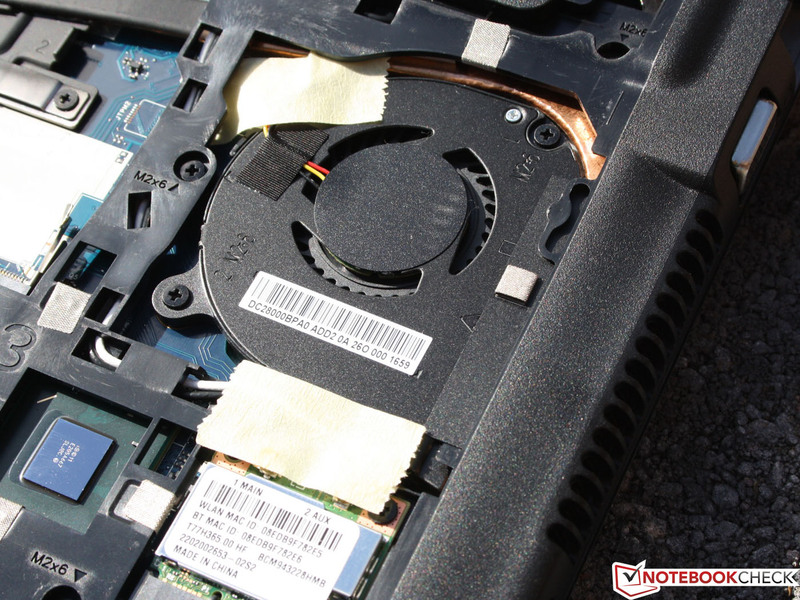 The fan can be cleaned when necessary (with compressed air). There is still space: A second RAM module can be added. 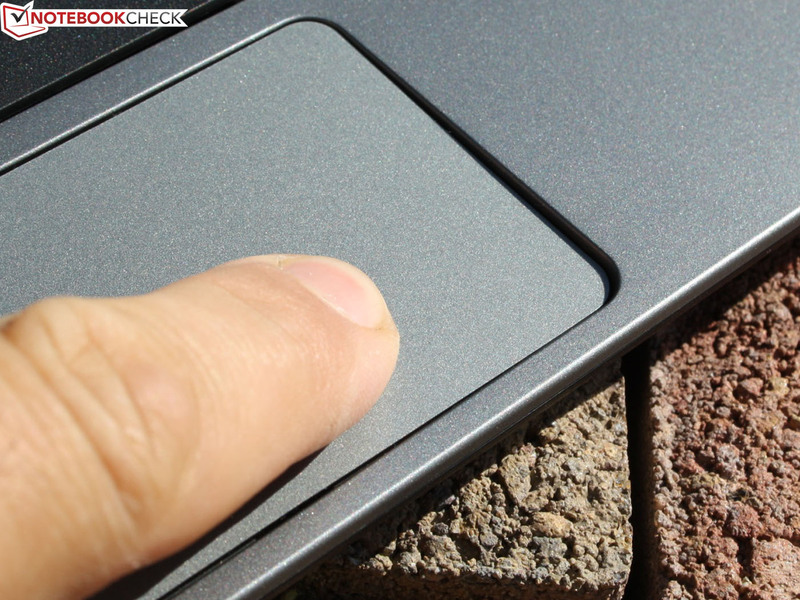 Acer Aspire V5-171: Office input devices would need better feedback. 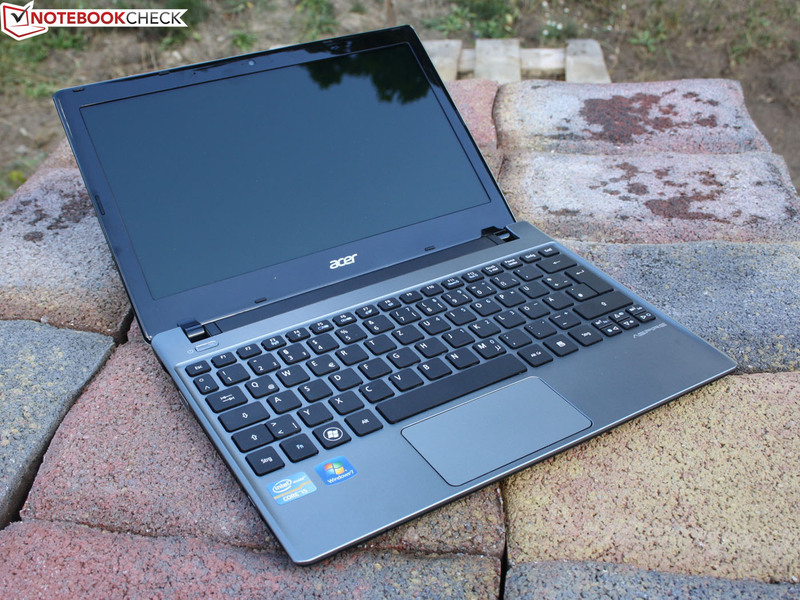 Acer Aspire V5-171: The performance is almost as good as an ultrabook (HDD). 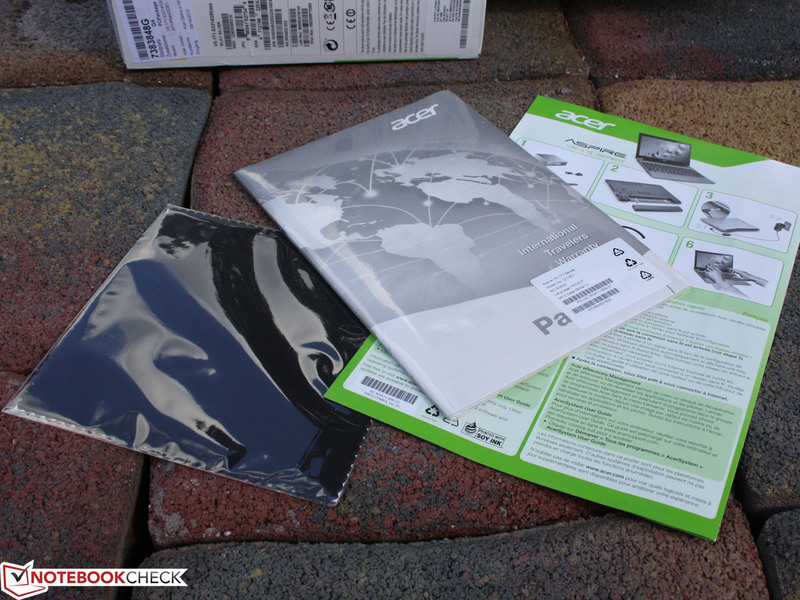 Acer provides only a brief instructions leaflet and a polishing cloth. It delivers up to 65 W, which is more than enough for all usage scenarios. 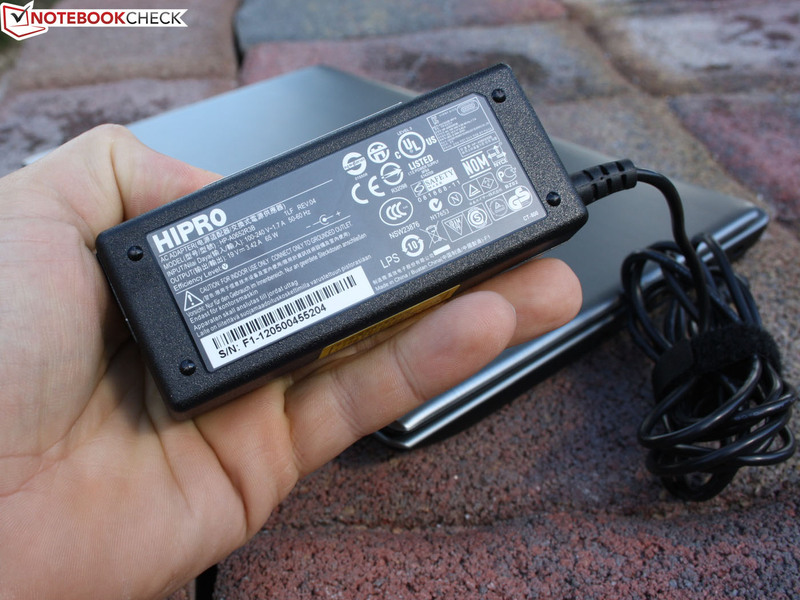 We would have preferred the power supply as a small AC adapter (see Aspire One 756). Why not make a compromise? but costs only 550 Euro (market price). with a modern Click-Pad (without separate mouse buttons). The keyboard has a weak, unclear feedback. This is due to the somewhat unclear pressure point. But the keyboard has a firm base. but also a USB 3.0 port. The card reader with its SD dummy is located on the left of the front side. 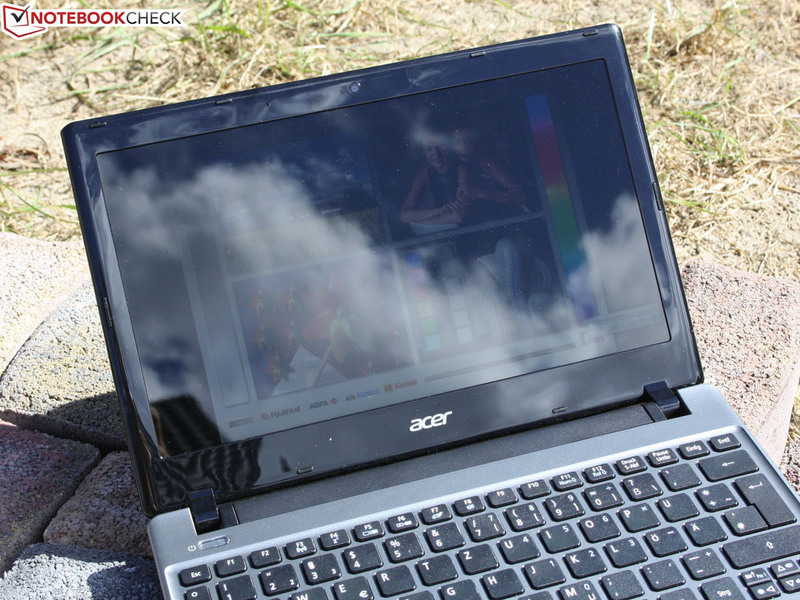 Acer Aspire V5-171: The glare type panel is a real mood killer in the sunshine. Very quiet in normal use. Low power consumption for energy savers. Energy saving hardware, but a glossy screen and a weak battery. The low battery runtime is self-inflicted. How much the hard drive slows down the system performance.